Sometimes accidents happen, or injuries occur that temporarily reduce your mobility. For people who’ve had surgery on or an injury to their foot, ankle, or lower leg, recovery may require not putting any weight on the injured area for an extended period. That rules out typical solutions like standard canes or quad canes, as they still require weight on your leg. For the longest time the best solution for someone in that condition was a set of crutches. But for many that can seem like a prison sentence, because crutches can be unstable, painful, and in many cases very inconvenient. Thankfully, now there is another option. 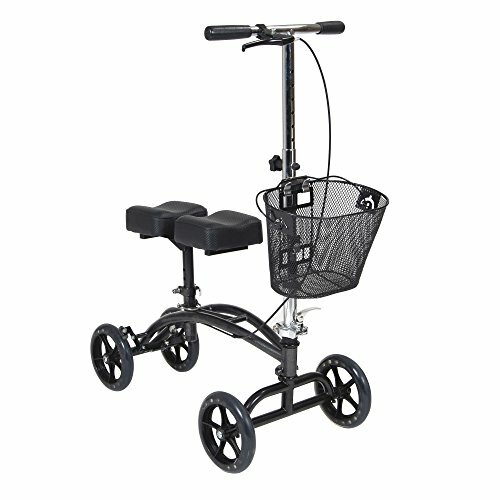 A new class of mobility product on the market is the Knee Scooter or Knee Walker. These devices are designed to give you back freedom of mobility and allow you to live your life while you recover from your injury. While at first glance they may look similar to a child’s trike, these crutch alternatives are more than that. They are engineered for stability and strength, allowing you to navigate both indoors and outside without the choppy armpit-jarring action of crutches. 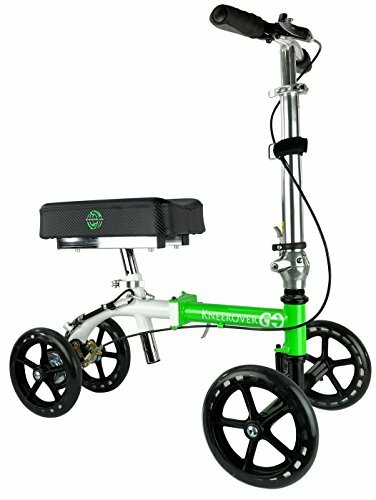 There are a number of manufacturers offering Knee Scooters, giving you a variety of models to choose from. But not all knee scooters are created equal. Some are specifically designed for heavy duty or off-road use, while others are tailored specifically for people that are either larger or smaller than average. To help you pick the best one for your particular mobility challenges, we reviewed the top knee scooters on the market and put together this buyers guide. We compare features for these mobile medical supplies, and look at the strengths and weaknesses of the different models so you can make an informed choice. We compare features on these specialty walkers – things like hand brakes, cup holders, and whether or not than can be easily folded for storage. Our pick for the best overall knee scooter is the KneeRover GO Knee Walker. Some knee scooters can be cumbersome and take up a lot of space, but the KneeRover GO is a light and portable option. This compact knee scooter weighs only 20.4 pounds but can hold up to 300. The small size means you can move around and turn more easily and within a tighter space, making it easier to maneuver indoors. The width is only 15.5 inches and the wheels measure just 7.5 inches, so it’s simple to fold it up and store it at home or in your car. Thanks to the handlebar folding down, you can fit it into the backseat of your vehicle for easy storage and removal. This knee scooter is easy to put together so you can start using it right away. It offers good stability and a comfortable cushion. The light weight and small size makes it fast too, so users can quickly scoot around either at home or while out and about. The smooth movement enables moving over a variety of surfaces with ease. Stops on the steering column mean you can turn well but you’re prevented from turning too far, which stops you from tipping over and keeps you safe. The KneeRover GO knee walker is designed for the person on the go that won't let an ankle, foot or leg injury slow them down. Perfect for commuters, travelers, or people that just need a compact and portable mobility device to go about their busy life. LIGHTWEIGHT & PORTABLE: The KneeRover GO weighs only 20.4 lbs., while the front axle and center frame are designed to fold the knee walker into the most compact size possible. 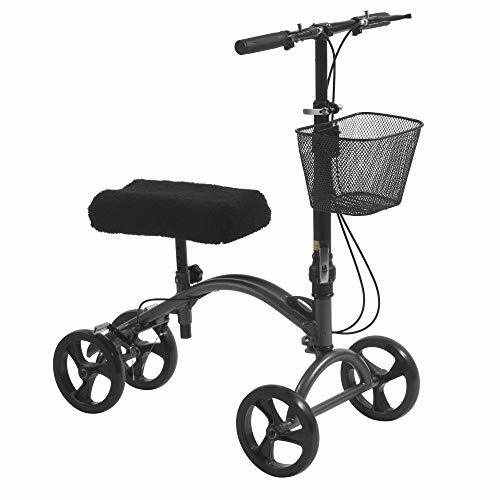 Fully adjustable handlebars and knee platform, this lightweight yet sturdy knee walker offers a robust 300 lb. weight capacity and is recommended for individuals with heights 4' to 6'2". Our choice for the best all-terrain knee scooter is the KneeRover HYBRID Knee Scooter with All Terrain Front Axle Upgrade. Are you looking for a slightly larger knee scooter option that can take on all terrains? This hybrid choice has sturdy wheels so it’s ideal for using outdoors and tackling a range of different surfaces. The air filled front tires are combined with advanced tie rod steering technology and a slightly larger turning radius to give you excellent stability, even when turning. You can use it across your lawn and around your yard, or take it out and about across sidewalks, gravel, cobblestones, and more. As a hybrid model, it’s great for more gentle usage indoors too. Despite the wider turn angle, you can still turn well in tighter spaces. The drum brake gives you good control, and the adjustable handbrake locks so you can stay still when you need to. This knee scooter is easy to assemble in just a few minutes. It also has a removable front axle to make it easy to fold down and store or transport. The included basket is very handy for trips out of the house too, allowing you to carry your groceries or other items with ease. This scooter is also a good choice for taller people up to 6’6″. ALL NEW KneeRover HYBRID Knee Walker is the first knee scooter to feature 9 inch All Terrain Pneumatic front wheels in a four wheel design for maximum freedom and stability. Navigate a range of terrain and gaps in sidewalks with increased stability. 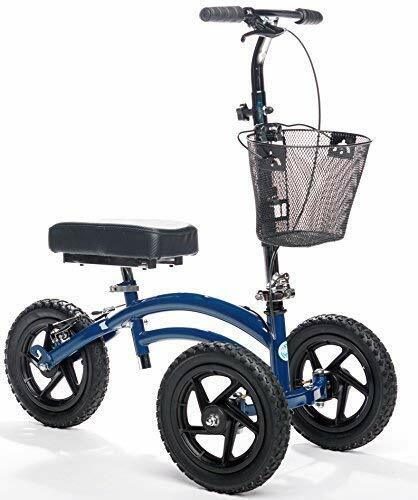 Combines the top rated performance and stability of the KneeCycle knee walker with an All Terrain front axle featuring 9 inch pneumatic wheels for increased freedom of mobility. Ideal for individuals recovering from injury or surgery to the foot, ankle or lower leg as well as below the knee amputees. KneeRover HYBRID Knee Walker is one of the most advanced knee walkers in the industry and an excellent crutch alternative. These steerable knee scooters offer an advanced automotive style tie-rod steering mechanism (not available on most knee walkers) and an adjustable locking handbrake. The Knee Rover HYBRID knee scooter features fully adjustable handlebars with a quick folding mechanism for easy transport and storage. Sturdy knee walker offers a robust 300 lb. weight capacity and is recommended for individuals with heights 5' - 6'6". A good steerable knee walker is the Drive Medical Dual Pad Steerable Knee Walker. Unlike some other knee scooter options, the Drive Medical Dual Pad Steerable Knee Walker has two cushion pads. These are designed to offer a more comfortable experience by distributing your weight more easily. The seat and handle can be adjusted without the need for any tools; the handle can be adjusted from 31 to 40 inches, while the cushion can be moved between 16.5 to 20.5 inches. The steering column folds for carrying and storage with a quick flip, and the front basket is also removable so that you can cut down on the amount of space it requires. The scooter has bicycle-style brakes, with a brake on each rear wheel. Easily bring yourself to a stop whether you’re indoors or outdoors, and lock the brakes into place by holding them down and pressing a button. This sturdy scooter has a smooth glide and a capacity of 350 pounds. Well built and with a sizeable basket, you can rely on this scooter if you need support for your foot, ankle or leg. While this scooter might not be able to handle the most rugged terrain, it’s still a good choice for a variety of environments. Overall Dimensions: 30"(L) x 16"(W) x 31"(H); Knee Pad Dimensions: 15"(L) x 7"(W) x 16.5"-20.5"(H); Handle Height: 31"-40"
A good folding knee walker for easy transportation is the KneeRover Deluxe Steerable Knee Cycle. The KneeRover Deluxe Steerable Knee Walker is sturdy but lightweight. It weighs only 24.8 pounds, making it easy to ride and to transport when you’re not using it. It has a removable handle and axle bars, as well as a quick folding mechanism so it’s easy to store. A strong 300-pound weight capacity means it’s suitable for almost anyone. The wheels have shock absorbing windows to provide extra stability indoors and outdoors. The adjustable knee pad has a three-inch cushion, and you can adjust it up and down without requiring any tools. The contoured cushion together with the ergonomic handles make this scooter a comfortable ride. The smooth rolling movement also ensures you feel comfortable while using the scooter, giving you the ability to navigate flat surfaces from sidewalks to carpet. It can even handle slightly rougher terrain, including small gravel stones and uneven sidewalks. Come to a quick stop with the drum brake system for reliable control. The scooter is suitable for people of a wide range of heights, from under 4 foot to well over 6 foot, ensuring comfort for all. 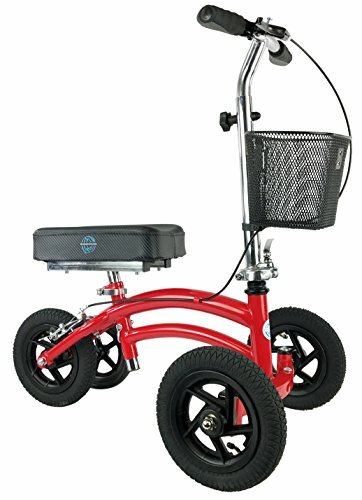 A great heavy-duty knee walker is the All Terrain KneeRover Steerable Knee Scooter. When you need a knee scooter that can handle all types of terrain, this All Terrain KneeRover is your top choice. It’s designed to go steady and strong over all types of surfaces, which means it’s ideal for people who don’t want their injury or disability to stop them getting out and about. This sturdy knee scooter can handle anything from smooth floors indoors to gravel paths and even sand on the beach outdoors. The 12-inch pneumatic tires will take on anything, and the steering adds extra stability to ensure the user always feels safe and stable. The heavy duty frame can still be folded up with the quick release folding mechanism. The front axle can also be removed so that you can store it in a more compact configuration. Adjust the 3-inch knee pad to suit your height and comfort, as well as the handlebars, with the tool free design. 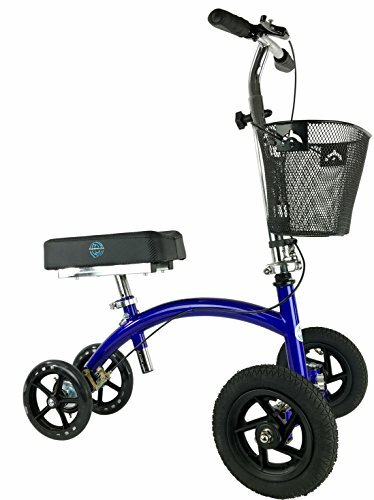 Using this all terrain knee scooter, you can remain active even when you only have one leg in action. If you don’t want to be stopped from enjoying the outdoors or navigating around your home, an all terrain knee scooter should meet your needs. Ideal for individuals recovering from injury or surgery to the foot, ankle or lower leg as well as below the knee amputees. 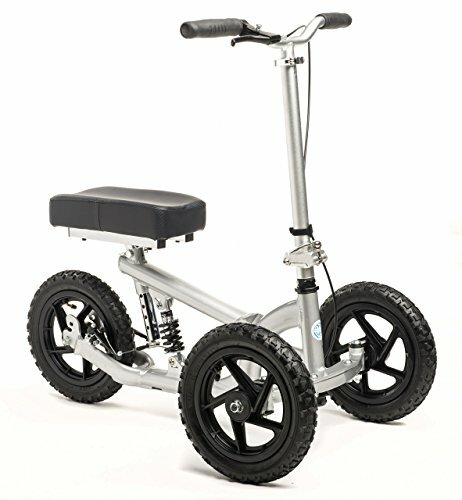 The All Terrain Knee Rover is an excellent alternative to crutches and offers the most versatility among knee walkers. 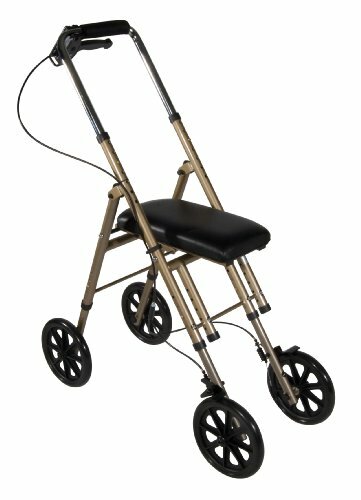 Maximum stability and control when maneuvering - these steerable knee walkers offer an advanced automotive style tie-rod steering mechanism (not available on most knee walkers) and an adjustable locking handbrake. Heavy duty double bar construction offers unprecedented strength and stability for a knee scooter. 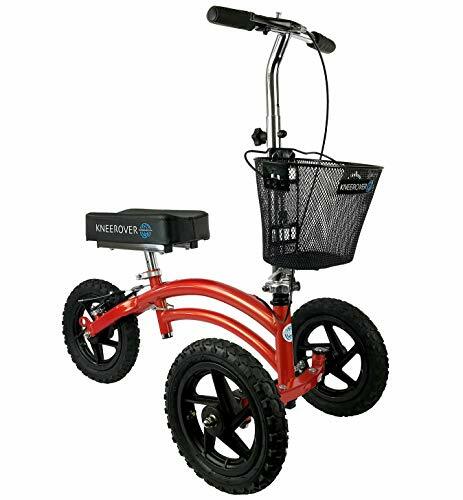 All Terrain Knee Rover knee walker offers a 350 lb weight capacity and is recommended for individuals with heights 5'6" - 6'5". Ideal for small adults and kids recovering from injury or surgery to the foot, ankle or lower leg as well as below the knee amputees. The All Terrain KneeRover Jr is an excellent alternative to crutches and offers the most versatility among knee walkers. Indoor - Outdoor All Terrain knee scooter features 9 inch pneumatic tires - perfect for navigating your home, work, and any terrain with ease - including grass, gravel, dirt and gaps in sidewalks. Heavy duty double bar construction offers unprecedented strength and stability for a knee scooter. 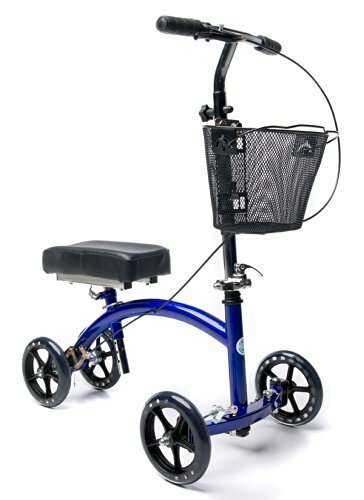 All Terrain KneeRover knee walker offers a 250 lb weight capacity and is recommended for individuals with heights 4'3" - 5'9". EASILY ATTACHES TO MOST WALKERS: Stretchable elastic straps easily secure the soft platform cover to most knee walker models. The non-slip cover firmly stays in place, reducing friction and preventing injuries while protecting the knee walker pad from everyday wear and tear. MACHINE WASHABLE: Easy to clean cover is machine washable with like colors and fluffed dry on low heat. SOFT FAUX SHEEPSKIN: Plush, faux sheepskin material comfortably cushions the knee without irritating the skin and allows air to circulate freely around the knee and lower leg. The soft knee pad cover effectively reduces fatigue and provides exceptional comfort throughout the day. RELIEVES PAIN AND PRESSURE: Supplying an extra layer of soft cushioning, the knee walker cover evenly distributes the pressure on the knee and lower leg for all day comfort. Evenly distributing the pressure created from kneeling on the knee pad greatly reduces pain and fatigue in the hip, knee and leg. Another must-have accessory for your knee walker is a universal phone holder mount. NEW KNEEROVER PHONE HOLDER - designed for all knee walkers and scooters, including all Knee Rover knee scooters. 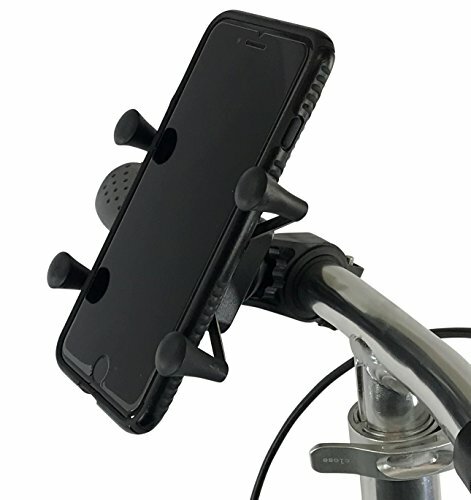 UNIVERSAL ADJUSTABLE PHONE MOUNT: Will securely fit any cell phone between 2" and 3.25" wide with or without a case such as the iPhone X 8 8+ 7 7 Plus 6s 6+ 6 5s 5c SE, Samsung Galaxy S9 + S8 S7 S6 S5, & Other Mobile Smart Phone Devices. FULL 360 Degree ROTATABLE PHONE HOLDER: Allows you to set your best viewing angle and safely remain hands-free navigating your knee walker while using GPS or other apps. SAFE & SECURE HOLD: A strong clamp holder with 4 soft tapered rubber arm supporters reduce vibration while securely holding phone in place, even if take your knee walker off road. Volume keys, power key and home button remain free for use. KNEE SCOOTER HANDLEBAR COMPATIBILITY: Mount clamp fits on knee walker handlebars with a width from 0.80" to 1.10". Tools-free, easily install. Fits most knee walker brands.